Japanese baseball officials appear headed for the trenches after a court’s unprecedented decision to force a team to compensate a female spectator who was blinded in one eye when she was hit by a line drive at a ballgame. The decision handed down by the Sapporo District Court on March 26, the day before the regular season got under way, ordered the Hokkaido Nippon Ham Fighters professional baseball team, Sapporo Dome Co. and the city of Sapporo to pay the woman, who has asked to remain nameless, about ¥41.9 million (about $350,000). Although there have been similar incidents in the past of fans being hurt by foul balls and suing teams, this time an example is being made of the Hokkaido-based club with ramifications that are causing baseball clubs to take note, in what most of them view as a critical indictment of their sport. “It was a tragic accident but I was shocked when I saw that decision,” Chiba Lotte Marines president Shinya Yamamuro recently told Kyodo News. In the ruling, Presiding Judge Yasuhiro Hasegawa noted that the area above the almost 3-meter tall fence for the infield stands was not furnished with protective netting. The woman, in her 30s, who was watching a game between the Fighters and the Seibu Lions with her husband and family on Aug. 21, 2010, took a foul ball liner to the side of the face that ruptured her right eyeball and smashed bones in her face. The judge said simply warning spectators to be careful of foul balls by making public service announcements or on the large screen panels is not enough. One anonymous baseball official, an overblown metaphor notwithstanding, said the precedent did not bode well for teams who might become liable in the future. Although the team is considering appealing the decision, public safety at ballparks is a growing concern that some agree cannot just be swept under the rug. “We need to think about people who come to watch a game for the first time or people who don’t know the dangers of foul balls,” said Fukuoka Softbank Hawks’ public relations officer Isao Inoue. Similar lawsuits filed by spectators in the past have been either rejected outright or upheld on appeal. A man who claimed damages for partial loss of vision after being hit by a foul ball had his case rejected by the Sendai District Court in February 2011. The Sendai appellate high court later upheld the lower court’s decision. The same year in October, a woman, who was struck by a ball in batting practice and went blind in one eye, lost her case at the Chiba District Court. Japanese baseball has long relied on an implicit contractual agreement with fans, which in principle shields teams from taking responsibility for injuries. Said contract is printed on the back of tickets, effective at the time of purchase. Major League Baseball enacts a century-old doctrine called the “Baseball Rule” that protects teams and stadium owners from liability, as long as a screen shields spectators in the most dangerous seats behind home plate. Aside from the public address announcements, attendants roam Japanese ballparks warning spectators of foul balls by blowing whistles. In seats that protrude into foul territory — aptly named “Excite Seats” at Tokyo Dome — fans are advised to don helmets. Purists of the game argue that more safeguards, such as expanded netting, detract from the actual ballpark experience and say it is like viewing the game through a gridiron. While some fans relish the opportunity to lunge for or chase down foul balls, others want to avoid these cowhide projectiles at all costs. “It is our mission to both secure public safety and have fans enjoy themselves. 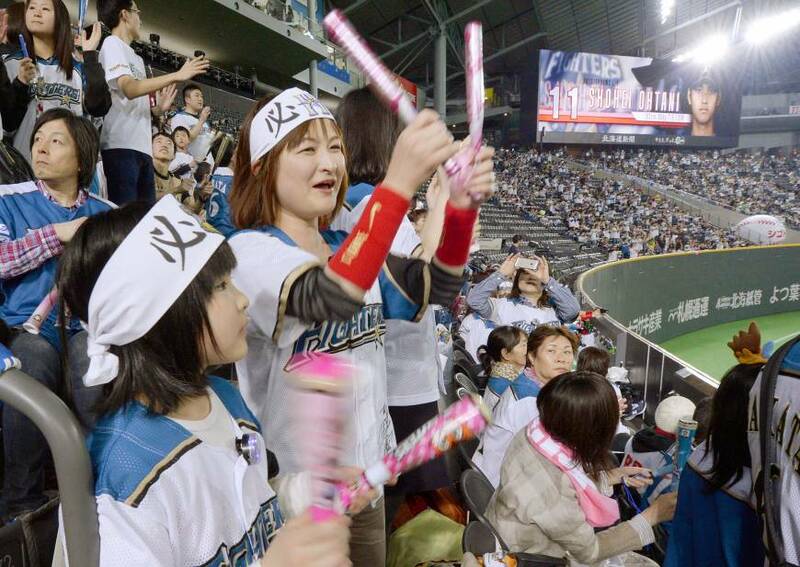 The balance is difficult,” said Tsuyoshi Motomura, deputy director of the Seibu Lions’ business division. “If you put netting all around it will make it more difficult to see. It’s a question of priority,” said one Central League top official, who requested anonymity. “I am scared of places where a lot of foul balls fly. I would like for them to attach a protective net,” said Mari Ikehara, 27, a company employee of Osaka, who watched a game at Mazda Stadium in Hiroshima on March 28. “It is a pity that safety measures are being called into question. In a way, I think it is probably an individual responsibility,” said a man in his 60s, who watched a game at Tokyo Dome the same day. According to a Bloomberg article, there were some 1,750 injuries that resulted from spectators being hit with foul balls in the major leagues last season. Nagoya Dome, home to the Chunichi Dragons, counted 115 spectators who requested in-house first aid after being struck by balls in the 67 games played at the venue last season. Robert Gorman, co-author of “Death at the Ballpark: A Comprehensive Study of Game-Related Fatalities,” said there is little incentive for ballparks to improve safety because of the legal concept of “assumption of risks” — meaning fans must assume the risks of being injured if they go to the ballpark. “It is very difficult for a fan suffering an injury at a game to receive any sort of compensation as long as the park is providing minimal protection,” Gorman told Kyodo News.